Elmer Nordahl Benrud was born near Cashton, WI, son of Anton and Maria (Dokken) Benrud. He was baptized in July 1893, and confirmed October 4, 1904, at the Immanuel Lutheran Church near Cashton. He attended the Woodard school. On June 3, 1916, he married Julia Bjornstad (1891-1948) and they farmed at Cashton until 1917, when they moved to Broderick, Sask. In October 1950 he married Irene Liddle (1894-1971) and they moved to Outlook. About June 1974, he married Esther Thorpe (1909-). Elmer was still very active when well past 100 and lived to the age of 103. 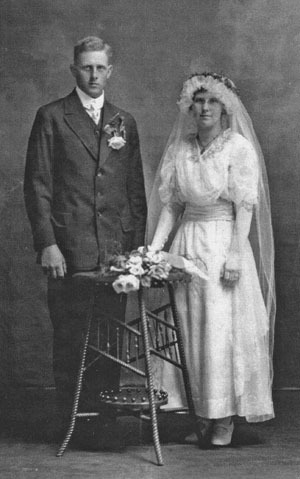 Elmer and Julia had two children: Gordon (1918-1918); and Eunice, Mrs. Otis Grunerud ( ).